Bentley sure makes some nice cars, don’t they? They really do. Lovely, impressive things, full of grandeur and presence. But that doesn’t mean they’re infallible. In fact, they make a pretty bold claim right on their website about making the “most powerful four-door car in the world” that a Jalopnik reader named Thomas sensed may not be true. Well, if we’re talking “powerful” as in engine power, as in horsepower, that’s not really true. 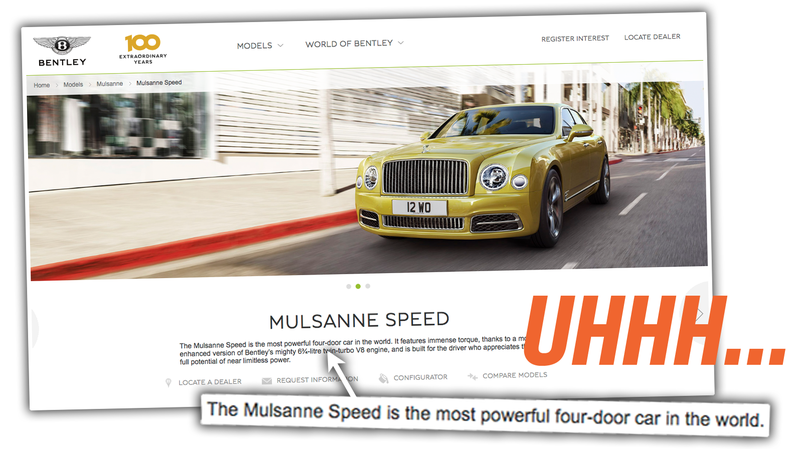 The Mulsanne Speed makes an impressive 537 horsepower according to Bentley’s website. That’s a lot of proper British horses, no question. But what about the Dodge Charger SRT Hellcat? That’s got four doors as well, and it famously makes an insane 707 HP, all for about $250,000 cheaper, too. You could also get yourself a Mercedes-Benz AMG S 65 sedan, which also comes with a full set of four opening body panels we call “doors,” and moves those doors around with a 621 HP V12 engine. It’s also expensive as hell, but still about $100,000 less than the Bentley. Or what about a BMW? BMW will sell you a four-door M6 (even though they call it an “M6 Gran Coupe” because they’re stupid about what words mean) and that sedan will make 560 HP normally, or 600 if you get the Competition package. Now, in Bentley’s defense, maybe, just maybe they’re not talking about horsepower at all, but by “powerful” they mean torque. If that’s the case, then they might just have a claim on the “most powerful four-door” title, since, at 811 pound-feet, the Mulsanne Speed does a hell of a lot of twisting. I reached out to Bentley, and, yes, it’s torque they’re basing the claim on. Unfortunately, they’re still wrong. And it’s a pretty unlikely car that proves them wrong: the Karma Revero. Yes, the former Fisker Karma, for all of its considerable shortcomings, does still manage to be a four-door car that makes an insane 918 pound-feet of torque. That doesn’t mean it’s any good to drive, of course, but if torque is what Bentley is basing their “most powerful four-door car” claim on, that’s busted, too. I’m really curious to see if or how they change this.